New technology allows appraisers to gain efficiencies, increase productivity and raise service levels. 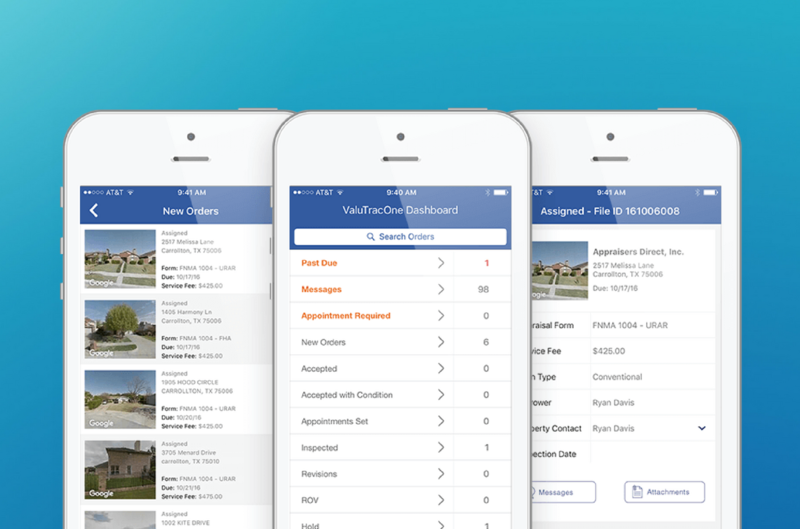 ValuTrac Software, provider of the industry’s most configurable appraisal management software for both residential and commercial valuations, has announced the launch of ValuTracOne appraiser portal and mobile application. ValuTracOne is a single access point that connects appraisers to all of their appraisal management company (AMC) and lender clients who are supported by ValuTrac Software’s primary products, ValuTrac Pro and ValuTrac Pro Plus. ValuTracOne enables appraisers to manage their entire pipeline of appraisal orders seamlessly, in one location with one login. Appraisers can use ValuTracOne to securely receive assignments, set inspection dates, transfer documents, send client messages, as well as view real-time status of their entire appraisal pipeline from all of their clients supported by ValuTrac Software. ValuTracOne, syncs automatically with the ValuTracOne mobile application, which is free and available for both Android and iOS mobile devices. ValuTracOne was developed as part of ValuTrac Software’s increased focus on the specific needs of appraisers. The company consulted with numerous appraisers in developing ValuTracOne, which has been credited for significantly improving the day-to-day management of appraisal assignments by the technology’s appraiser beta testers. The ValuTracOne mobile application improves appraisers’ processes when they’re out in the field inspecting properties, which is frequent. ValuTracOne uses push notifications to alert appraisers instantly whenever they have new assignments or client messages. Appraisers can use the mobile application to quickly accept assignments and provide responses to client messages. For more information, please visit the ValuTracOne website.